And other dental and oral health services. Conveniently located to service families at Paravista, Paralowie, Para Hills, Edinburgh, Mawson Lakes, Burton and the Salisbury and Elizabeth areas. 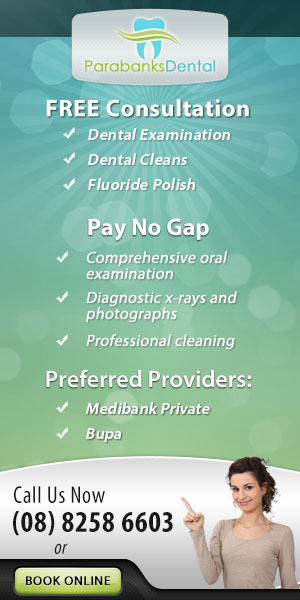 A family-friendly and multicultural aware team of Dentists who seek to provide the best dental care available and to ensure comfort and expert pain minimisation techniques. Expert male and female dentists who are dedicated to your comfort and safety during your dental appointment. We cater to your Emergency Dental Treatment needs. We can provide you with a recommended treatment plan, which can then be tailored to meet individual and financial needs. We are also a BUPA and Medibank Private preferred practice, offering a higher private health rebate on most services provided within our clinic. Call: 08 8258 6603 for further information about your health insurance. Our main goal here at Parabanks Dental is to help you and your entire family in achieving utmost dental and oral wellness so that you all can enjoy a lifetime of healthy and beautiful smiles – Call: 08 8258 6603. Our dental clinic is situated right next to Bank SA on John Street and parking is available at the front or rear of the area. This includes provisions of parking and entry for differently abled patients.